APRIL SHOWER'S 100th Post Giveaway!!!!! April a.k.a. 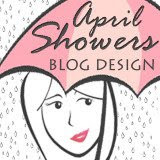 April Showers is celebrating her 100th post!!! To commemorate, she is having a super duper giveaway!! It really is super duper - there are four categories and she is allowing two winners in each category - yeah, told ya! With the Creme De La Creme being one of her sexi customized blog designs!! 1.) Totally Awesomely Amazingly Wonderful Customized Blog Layout! 2.) A $40 gift basket filled with TONS of customized mark. and Bath and Body Works products! 3.) Custom Illustration! How cute would you look as a cartoon? 4.) 10 winners will get 50% off any blog TLC items of their choice! So why am I posting about it??? Can you say Blogger template??? I see so many lovely blogs out there. I picked the name of my blog based on what I want it to eventually be & also a poetry book called Silver Pennies that my Mother used to read me poems from. I think the Wishing Penny could quite possibly spark a pretty sexi blog design. Don't you??? As a treat, I will leave you with a poem from Silver Pennies - Happy Day! And yet it is never the so,me.